Lisa has written to say that she was able to locate on in NYC, so this need has been taken care of. We tried our best to help, but I’m glad she was able to find one on her own. One of the leggings is missing in this photo. I am looking for a Plush Donkey that Old Navy sold in 2007/2008. She desperately wants another one. 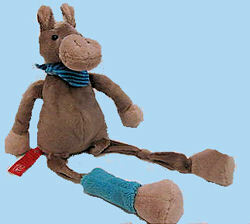 If you can help Lisa find this 2007 or 2008 Old Navy donkey, THIS SITE IS NO LONGER ACTIVELY MANAGED. Please use Our FREE FACEBOOK GROUP, including #091708-2 in the subject, . I have emailed the seller on eBay with a link to this post, just in case they would be willing to stop the bidding and sell this donkey to Diana instead. We’ll just have to wait and see. There is one on ebay with both leggins again and it is going for fifty dollars. A bit extreme for a doll but if it is needed. Diana did get the donkey. All finished requests are marked FOUND in the title. But thanks for the information, ANON, in case someone else is searching and sees this.